← Crow curiosities: who is begging in April? If there’s one corvid that’s most notorious for getting into trouble, it’s probably the large-billed crow (sp: Corvus macrorhynchos* ). A dubious reputation perhaps, but it’s one that’s been well earned through this corvid’s knack for exploiting humans and the opportunities we create. 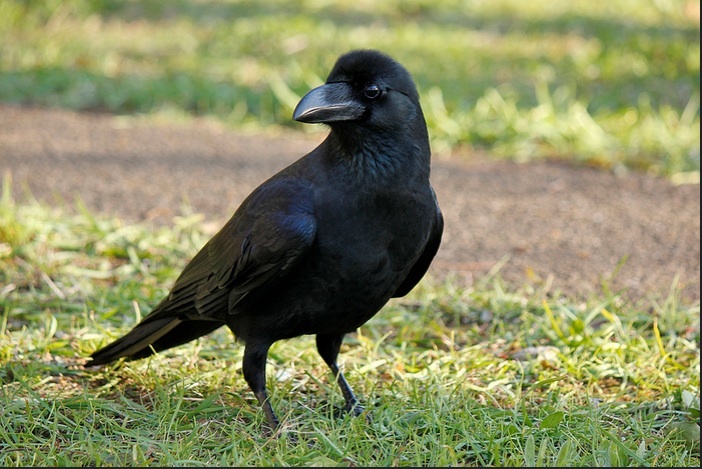 Physical description: While large-billed crows aren’t much bigger than an American crow, their square head and heavy bill gives them a more raven-like appearance. To me, they look like what I might expect if a common raven tangoed with Rick Moranis’s contraption from Honey I Shrunk the Kids. Range: They are found throughout the northeastern Asian seaboard to Afghanistan and eastern Iran in the west, through South and Southeast Asia, to the Lesser Sundas and Cambodia in the southeast. Although in India the eastern jungle crow and large-billed crow behave has two distinct species, in northern parts of Asia their distinction is less clear and colloquially the two are often analogous. Conservation status: Given their large range, it may come as no surprise that their populations are abundant and are considered a species of least concern by the IUCN. 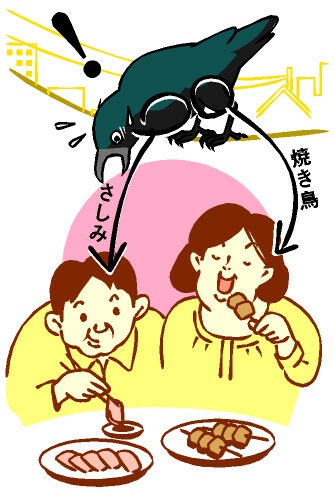 In fact, since the 1980’s the number of jungle crows in Tokyo has quadrupled1. So what accounts for their bad reputation you ask? Where to begin…how about vandalizing cemeteries1. In Japan, food is left at the burial sites of loved ones as an offering. 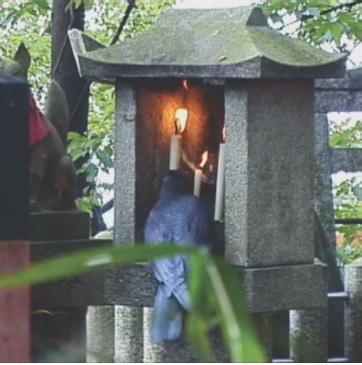 Although in some cultures these offerings are meant to be eaten by animals, that is not the case here, and the crows’ stealing of food interrupts the intention of the ritual. Historically, this probably wasn’t a conflict since jungle crow populations were much smaller than they are now. *The jungle crow was formally Corvus macrorhynchos, but the species was split into the large-billed crow Corvus macrorhynchos, the eastern jungle crow Corvus levaillantii, and the Indian jungle crow, Corvid culminatus. here’s Christian from Bremen, Germany, again. Ok, I’m an atheist – have a look at Bertrand Russell’s book “Why I am not a Christian”. 😉 He’s right! ust want to say the nut-cracking-on-crosswalks crows seen in the YT-video are most likely carrion crows rather than jungle crows. They are there in Japan, too. 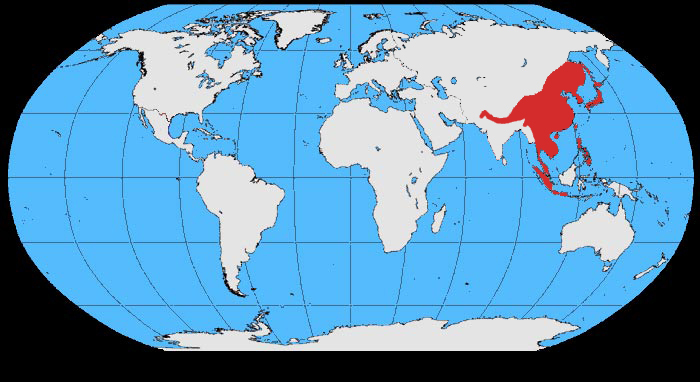 There’s a distribution map of carrion crows at en.wikipedia: Europe and eastern Asia. The big gap you can see there is filled by hooded crows. Crows are crazy birds everywhere. 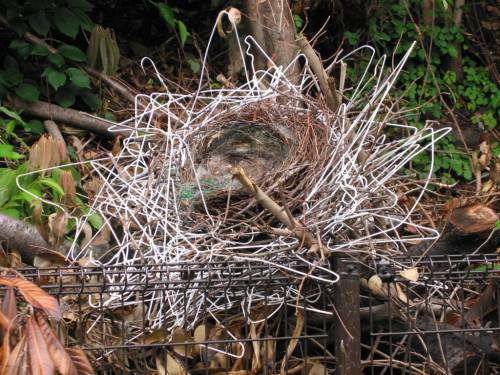 This nest building with coat hangers shows it clearly – but it’s really just one idiosyncrasy of oh so many. Christian, thank you for point this out. Let me clarify: jungles crows are one of multiple species of crows that have been observed (anecdotally) to use cars and crosswalks in this way. The literature I cited in the article, though, is specifically talking about jungle crows which is why I decided to include them here. The video is mostly for illustrative purposes but, you’re right, the featured birds do not appear to be jungle crows based on their rather thin bills. I know this is an old post Kaeli but I recently watched a YouTube video on the hordes of cars heading out each night in Japan to destroy crow nests on power poles that were made with wire hangers, they spend millions on this… I just wondered why they don’t switch to the plastic hangers we use here in North America, because they are not malleable the crows would not be able to nest build effectively with them and it would eliminate the constant power outages caused by metal wire hangers. BTW my crows have left again from High River AB, they do this every October and I can’t find (online) where they go, presumably somewhere warmer. It states there however that crows don’t migrate, at least at the sites I have searched. Our ravens stay all winter out near the garbage dump lol and far away from us humans. Our magpies stay too. I love them all and am visited on a daily basis by many birds but my mated crows are my favourites, they raised a lovely chick this year and I loved watching the 3 of them, especially when they were trying to teach baby (who was by then as big as her mother) to bend over and pick up the food herself (I put out high grade, small pellet dog food, unshelled peanuts and a variety of nutritious seeds twice daily) She would sit on my feeding table and squawk constantly til her mother picked up the food and put it in her red mouth, finally the mother took an unshelled peanut and put it down on the grass and baby bent over and picked it up. I cheered quietly! But then she didn’t know what to do with it and strutted about quite proud of herself. I pray they will be safe over the winter and can’t wait to see them again. Hi Marilyn, that’s a good question. I don’t have an official answer for you but I imagine it’s the same as most other things: people really don’t like the government telling them what to do or being denied access to things they’re used to even if it’s really in everyone’s best interest (particularly wildlife) and will save everyone a bunch of money in the long run. Can me a cynic. 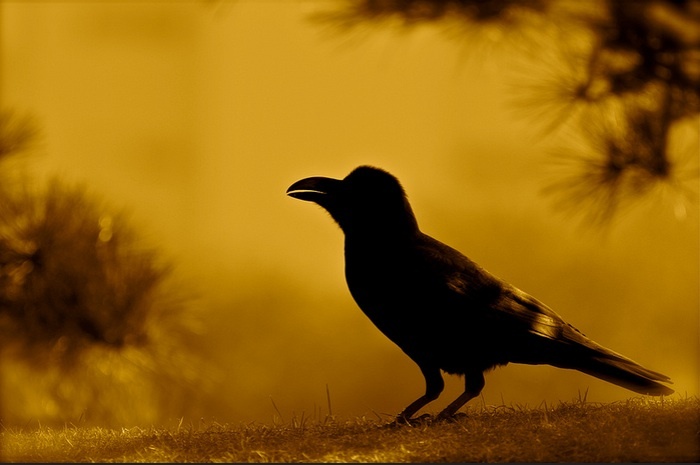 As for your migration question, yes most crows don’t migrate. But the norther great plains crows certainly do. Your crows will be heading to the southern great plains states like Nebraska and Kansas and will return to AB in the spring when temperatures heat up. I hope they all make it through the winter and return home for you! It is so good to know where my crows go in the winter! You have no idea! Thank you Kaeli!! Hi Kaeli! Our family is going to Fukuoka and other small islands in Japan known for their deer, monkeys old growth trees and sea turtles. I really hope to see some jungle crows in person! Thank you for the excellent article! Have fun, Kris! Take lots of pictures!